Left to right: Mamaolokoi Kinetsi, Kutlo Kinetsi, David Crawford, Mohale Khabo and his wife Matumelo. 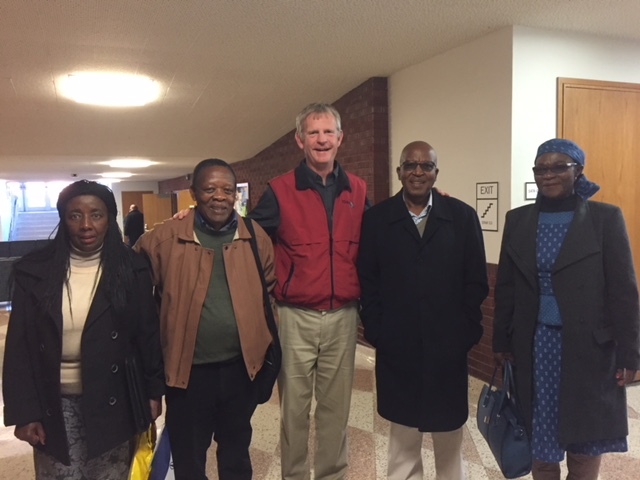 Kutlo and Mohale made a presentation to about 100 MSU students, faculty and Bozeman friends. Mohale talked about his job as the highest district engineer in Lesotho, in charge of developing and distributing water resources and sanitation to rural communities around the country. Kutlo worked with Mohale for a few years, and then began working on industrial development projects, doing utility, geotechnical and structural engineering to provide new buildings for his country’s expanding businesses. He became the chief engineer and began his own company. 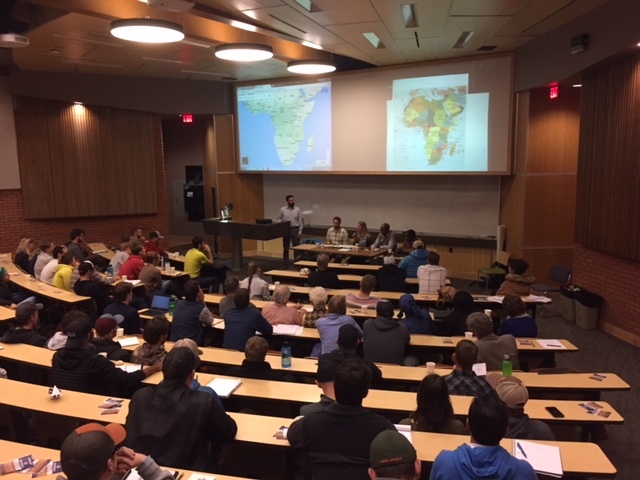 A presentation Kutlo and Mohale made to about 100 MSU students, faculty and Bozeman friends. “I really enjoyed visiting with these two bright fellows and their wives, who have done amazing things too,” says Crawford. Mamaolokoi got her degree in community development in Israel and then went into social work. Matumelo has a mini market and coordinates and markets eggs from over 500 laying hens, pork production and distribution in her community. While they were here, we took the opportunity to have them visit our Bozeman office and see some of the projects we’re doing. They were very impressed with TD&H Engineering, especially with all our computer aided design tools. This was a great opportunity to build international goodwill and continue to foster cooperation, peace and advancement of understanding among peoples of the world. “I would like to thank my friend Brent Campbell at WGM and Jerry Stephens, the civil engineering department head at MSU for making this visit possible,” says Crawford.